From the The Wizard of OZ collection by Spoontiques. The Wizard of Oz Ruby Slippers Eyeglass Case. This Item is in stock and ready to ship. You should not postpone your purchase and miss out on adding The Wizard of Oz Ruby Slippers Eyeglass Case to your The Wizard of OZ collection! From the The Wizard of OZ collection by Spoontiques. The Wizard of Oz Ruby Slippers Eyeglass Case with Cleaning Coth. Spoontiques The Wizard of Oz Household Items shipping from Canada. No Surprise Border fees or Customs! 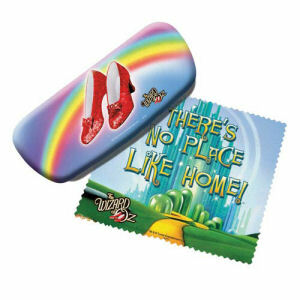 The Wizard of Oz Eyeglass Case with Cleaning Cloth.